The biggest single problem I’m seeing when working on enterprise networks is the lack of L3 logical network diagrams. Most of the time I’m facing situations where a customer doesn’t have any logical network diagrams to give. L3 diagrams are vital for troubleshooting or for planning changes. Also, logical diagrams are in many cases more valuable than physical ones. Sometimes I see “Logical-Physical-Hybrid” diagrams that are mostly useless. 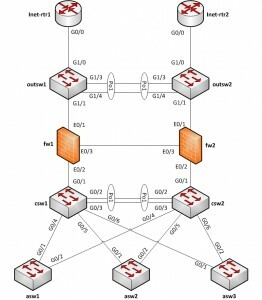 If you don’t know your network logical topology, you are blind. Generally, it seems it is an uncommon skill to be able to visualize networks logically. For this reason, I’m writing about drawing clear logical network diagrams. What information should be represented in L3 diagram? What information should NOT be represented in L3 diagram? Generally, logical symbols are used in logical diagrams. Most of them are self-explanatory, but since I’ve seen mistakes, here are a couple of examples. What information do you need to be able to draw L3 diagram? L2 (or L1) diagram – presenting physical connections between L3 devices and switches. L3 device configurations – text files or access to GUI, etc. L2 device configurations – text files or access to GUI, etc. Here are configuration files from devices. Only details needed here are included. Okay – now that we have all the information needed, let’s start drawing. Pick-up every single IP-address definition for the interfaces. In this case, there is only one address (192.168.10.11) and it has a mask of 255.255.255.128. The name of the interface is vlan250 and the name of vlan 250 is In-mgmt. Pick-up every static route from the configuration. In this case, there is only one (ip default-gateway) and it is pointing to 192.168.10.1. Now, lets visualize all information we have picked up. First, draw a device that has the name ASW1. ASW1 happens to be switch, so we’ll use the switch symbol. Draw a subnet (pipe). Give it the name In-mgmt, VLAN-ID 250 and network address 192.168.10.0/25. Connect ASW1 and the subnet symbols together. You are able to plan changes quickly and accurately. Troubleshooting is easier than before. Let’s say someone needs to resolve a problem where service is not working from 192.168.0.200 to 192.168.1.200. 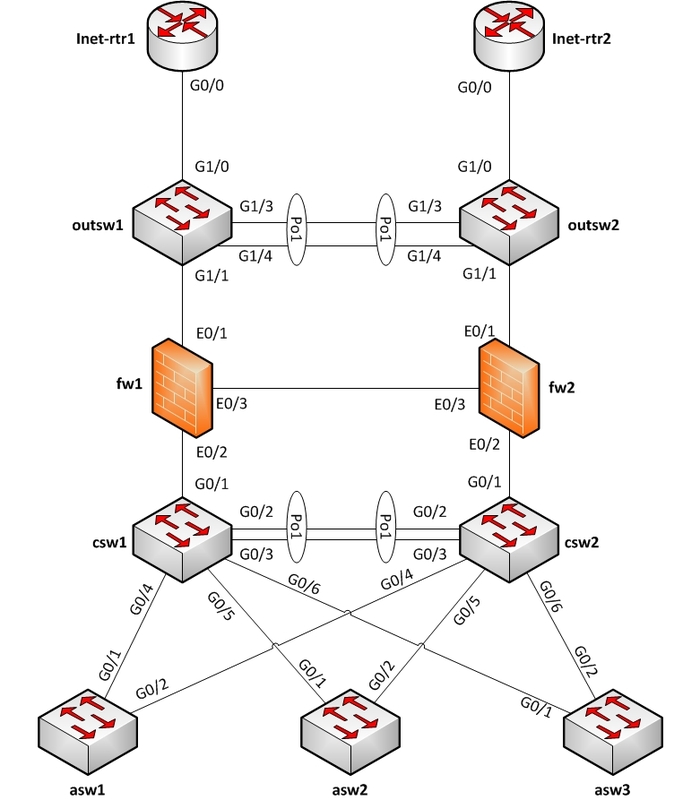 By looking at the L3 diagram, you can immediately say that it is not caused by a firewall. You can keep your firewall rulebases correct. I’ve seen situations where firewalls have rules for traffic that they are never going to route. That clearly shows that network’s logical topology is not known. Usually, once an L3 diagram has been completed, you will see immediately which parts are not logically redundant, etc. In other words, the L3 topology (and redundancy) is as important as physical redundancy. Very well written and timely blog post. I have struggled with diagrams up to this point in my career. The biggest question I usually have is “Am I putting too much information or not enough?” I appreciate the time you took to pull and show configs while also giving diagrams to illustrate. Do you think it would be appropriate to throw things in like routing processes if you are using a dynamic routing protocol? If so, what do you think would be the best way to fit it in? Again, excellent job! Looking forward to more from you. You must create separate diagrams for physical and for logical. The physical diagrams show how things are physically connected and how they are racked. The logical diagrams show how traffic gets from point A to point B. I agree 100% that hybrid diagrams don’t work. Also, when doing your logical diagrams, think in terms of North-South, East-West. We often talk about traffic in those terms. North-South traffic is like from the Internet into your site. This could also be from the MPLS WAN into your site. This should be top to bottom in your logical drawing. (like how Jaakko drew it) East-West traffic is traffic that passes between environments (or even tiers) within your site. (perhaps between two customers you’re hosting, perhaps between the web, app, and database tiers) This should be left to right in your logical drawing. Thanks! It really took time to write this. My opinion is you can put more information in the diagram if it is valuable and you will keep it up to date. Dynamic routing protocol information surely is that kind of information. Probably most visual way to present routing protocols is to draw colored areas(circle, rectangle etc) to the background. You can put other information (such as AS-number, protocol name etc.) as a text inside area. You can use different colors for each routing domain. Thank you for the reply and that makes sense. I’m going to start experimenting with new ways of creating diagrams for our team. Thanks again for this post! An Application Flow diagram is absolutely critical when troubleshooting any large-scale or “enterprise” type application. If you don’t know what pieces are involved, where they live, how they’re talking, and all that, you’re going to have a nightmare trying to understand a failure (especially if it’s performance related, and not “down”). I typically see that as separate from monitoring, though. Diagrams are documentation. Some monitoring tools can provide or assist with diagrams, and some do support “service” definitions, where they can monitor a collection of objects together to help you get status information for an application, but I think it should complement your network and application flow diagrams. So you but all access switches which do only L2 forwarding in the L3 diagramm because they have an IP address in the managemet vlan? I think it makes more sense to have only L3 devices in the L3 diagramm. Well they are L3 devices from management point of view. I put management interface of L2 switches into L3 diagram because of I always want to see visual way which path management connection is going. This is must when making changes. Jumps are a carryover from electrical engineering circuit design that were abandoned over 20 years ago (for good reason), and could only be relevant in designing a circuit to reflect paths of physical conductivity. So much for leaving out L1 from an L3 diagram. A pipe for a subnet? Has anyone looked that the diagramming used to design the Internet? Apparently not. I won’t even comment on how well the end product is to read. It does succeed in communicating, if clumsily. Sadly, unlike electrical engineering, there appears to be no real independently consistent standards for network diagramming. Just whatever visio tells you to do, which is just disappointing. Not quite understanding what you’re trying to say here John – particularly your middle paragraph about subnets. Do you have any examples you could point toward that illustrate what a network digram should look like? Why don’t you take the time to write up a better approch to making netowrk diagrams instead of critisising someone else’s work. The author is entitled to his opinion, as are you to yours, get to work buddy ! 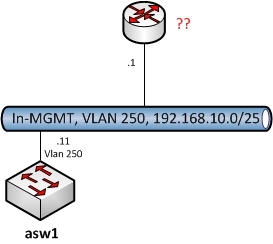 This is a dumb question, but routing between 192.168.x.x networks occurs on the switches, right? Right, and in CSWs to be more precise. Wow, how timely! I was recently hired to a company that has outdated info. I’m the new guy, so we/I need this kind of “visual.” I didn’t know where to start my own diagramming. One question: How do you represent accurately when multiple sub-interfaces are each in a different vlan on a router? Sorry I forgot to add logical interfaces to L3 diagram. Usually I add them. Subinterfaces are logical L3 interface in most cases. Usually I place them next to the IP-address of the interface. 2) In some devices L3 interface can be SVI (Vlan5) or subinterface (G0/1.5) or same as physical one (G0/1). But every time L3 interface has IP-address. This helped a lot when I did a re-design of a client’s network. I do have 1 question on the CSW and how to represent each SVI. Do you draw several pipes to represent each SVI? Nice article. Helped a lot! Where is the Subnet “pipe” shape located? I was looking for how to make vehicular networking diagram and found it with Conceptdraw pro. I must say that I’m impressed with this product. 4) It gets a 4 Mouse rating from MacWorld. This is a great post. Question, how would you represent your wireless infrastructure? Would you show the connections on the L1/L2 diagram, break it out into a separate wireless diagram, or move them into the L3 diagram. I am mostly concerned with the APs, and where applicable, the controller. Usually I put WLC-controllers connections to the L2 diagram. In addition I mention SSID name in subnet they are related to in text format. In example: “10.10.10.0/24, VLAN 10, SSID: WIFI-USERS”. You can also descriptive name to VLAN for APs and put that to the L3 diagram. I know this post is getting a little old but I wanted to ask one quick question I didn’t see asked in the comments (maybe I overlooked it in the article too). When creating a logical diagram and you are labeling interfaces and you have a dozen or so VLANs tagged on a single interface, what’s the best way to show that? I probably don’t follow many of these practices here (as I should be). My process is simply to present the scenario. What is it you are trying to explain or show? If you have a good answer to this question and you accomplish this in a neat, organized, easy to read, network diagram then I think the mission was accomplished. If only you can read your diagram than you have failed. Representing VLANs traversing on trunk interface in L3-diagram makes no sense. This information can be presented in L2-diagram as it has relation to L2-topology. Usually I do this with text “VLANs 1,2,3-5” on the link. Hi guys i have one question. In my company we are using ASA firewall and catalyst switches. Once in a week our internet connectivity will go down /internet will become slow. we check the logs/bandwidth/and also from the isp side everything is claer what are the other possibilites to find please help me out. Great article about creating diagrams. One question though, how do you illustrate in logical diagram 2 sites connected by point-to-point? I am trying to follow your instructions and I am stuck in creating our diagrams because we have 2 main sites and a lot of hub sites, I am doing the diagram for the hub sites but I don’t know how to put it along with the main sites. Hi, what kind of connectivity you have between sites? IPsec tunnels? Fullmesh or hub and spoke? Do tunnels have IP-addresses (Route or policy based)? Do all sites belong to same subnet? Thanks for the quick response. We implement hub and spoke, two hub sites (primary and backup) connects all spokes sites, the 2 hub sites is connected to what we call “Global” MPLS, while all the spoke sites have point-to-point metro-e connectivity between the 2 hub sites. And no, each sites have different subnets for identity. One more question though, on the physical diagram is it necessary to include the access points, video conferencing and servers? And, do I have to put them on grouping boxes? I usually represent P2P connections as one subnet. You should also add providers link-ID to the diagram. Remember to add L3-interfaces to logical diagram. Would it be subinterface or VLAN interface. Include all devices into physical diagram you want. None of devices you mention is must in physical diagram but could be helpfull in some cases. If there is room I would add them as well. Great article. Which diagraming software do you recommend? Currently using Omnigraffle but want something that is geared more toward network diagraming. I use only MS Visio as everybody has that as well. Unfortunately, it is not really good for networking. You just need to get to know certiain things to get it work. I have planned to write a blogpost about Visio tips and general drawing tips as well. Guides like these would be a great help of course. When actually implementing the graphic some beginners aren’t aware of the standard cisco objects to draw L3 diagrams. The most important thing is some of the things can be illustrated in L2 as well. I have tens of switches in the same subnet but using different VLANs (tens of different VLANs). How to draw the pipe in my L3 diagram? So you have some kind of VLAN ID mismatch among switches? In that case I would add list of VLANs in the side of diagram using call-out shape and refer to that in pipe. In general, I think well implemented network is easy to draw. Where is the outsw1 and outsw2 sit? I don’t see them in the L3 diagram. They are not in the diagram. Actually I don’t put L2 switches in L3 diagram usually. Not even their management interfaces. Usually I place their management IP-addresses as text next to their hostname in L2 diagram. This is really great. Thank you for doing this post. Would it be possible for you to make the sample Visio files available for download? Hi, I’m wondering if you are planning a network, do you draw L3 network during the planning, and configure the devices based on the diagram, or the other way around? The problem with the end result drawing… Lines from vlan 210, 220, 230, 240 should be straight lines to csw1 and csw2 not L connector lines. Straight lines from vlan 101 and 102 to fw1 and fw2 are correct. Use of the L connector lines from vlan 210-240 to csw1 and is ugly and confusing. So answer is yes I always draw L2 & L3 diagrams beforehand. 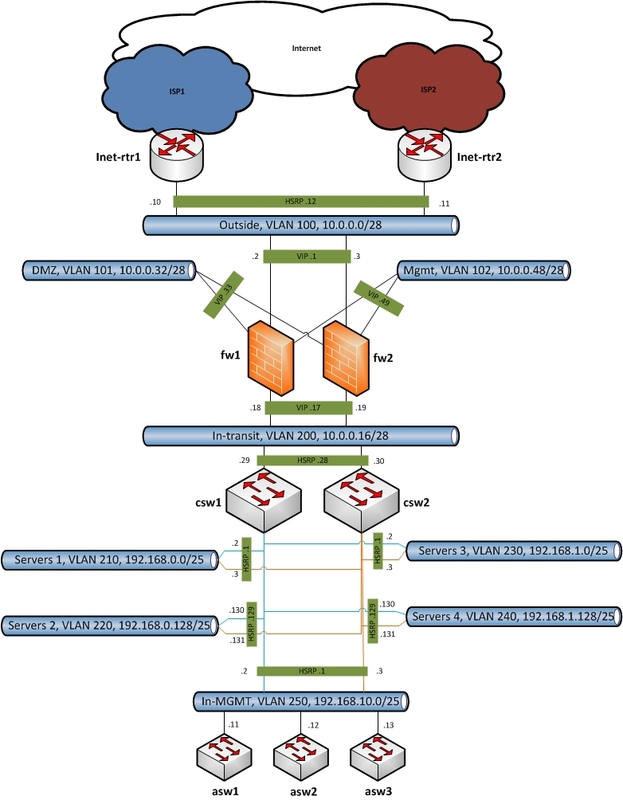 Does drawing a line between two vlan subnets (pipes) generally mean anything? Here’s what I’m trying to do; a firewall has lets say 12 vlans coming out of it’s port 2, I have limited drawing space and i need to connect lets say 30 different devices to different the vlans. I put them side by side (6 per column and 2 per row) but all vlans on the right have direct horizontal lines connecting to a vertical line out of the firewall, now to show the left vlans too are connected to the firewall vertical line so I sort of just drew a connecting line between the vlan pipes as though the lines continued down and also connected to the vertical line. I hope there’s some sense to what I’m trying to illustrate and ask. There I use curved lines to make it clear subnets are not connected together. And in Visio this means you cannot use those handles (yellow dots) included in Etnernet-shape but use normal connector instead. Great article. Do you have any tips for reverse engineering L2/L3 Logical Network Diagrams when that’s all you have?